Over the prior week (Monday 4th June to Friday 8th June 2018), the NSW region – and, to a lesser extent, the broader NEM – experienced a tight supply/demand balance. Our prime focus is (and always has been) on continually enhancing how we serve our diverse and growing range of clients, who use our software (and other products) to help them understand what’s going on in the energy market. Given that the events of that week were so complex (and coincidentally that I had pre-arranged commitments in NSW with a number of clients & others) it was not really a surprise that we fielded a number of questions (some described here) about what was going on. We appreciate these questions – as they stretch our capability to understand, and explain clearly, complex events such as what happened last week. 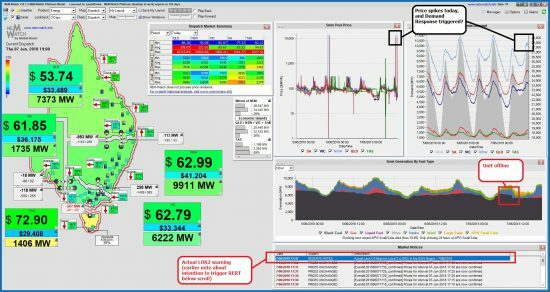 Over the weekend that followed, I was able to grab a few hours to take a more measured look at what had occurred through the week, as a result of which I could post the article “Recapping a shaky week for the supply-demand balance in the NSW region last week” on WattClarity on Monday 11th June. As noted on the NEMwatch portal, we found our (RenewEconomy-sponsored) NEMwatch Live Supply & Demand widget referenced in the Newcastle Herald. Drawing on the more detailed analysis published on Wattclarity on Monday morning, Andrew White from the Australian was able to publish an article on Monday 11th June “Paul McArdle of WattClarity: NSW power outages ‘threat to industry’” . On Tuesday, Ben Potter from the AFR included some references to the WattClarity article in his article “Big power resists AEMO ‘strategic reserve’ push after NSW squeeze” . After we’d both attended the launch of the Victorian Energy Policy Center in Melbourne on Wednesday 13th June, Ben Potter from the AFR also included reference to the WattClarity review of the prior week in his article “Energy expert to Tomago Aluminium: Buy cheap wind and solar power” .